Rubus albescens. Origin: India, Malaysia. 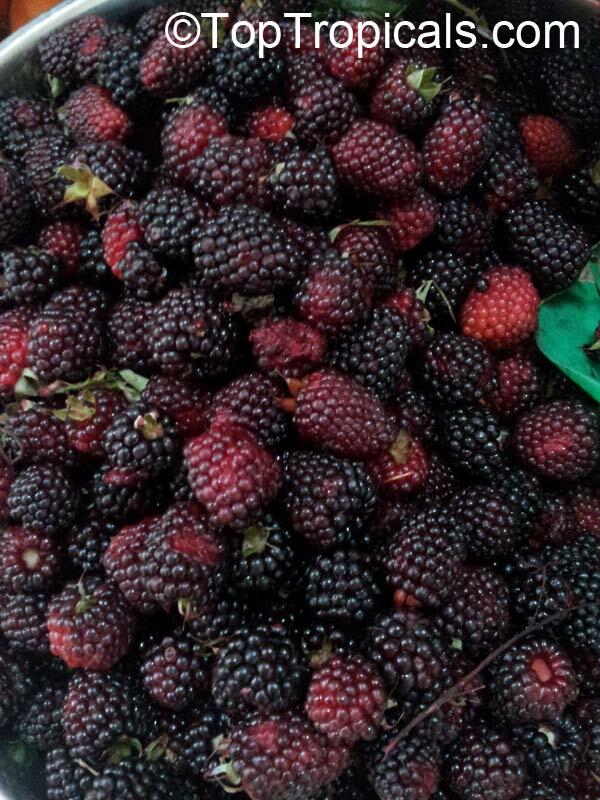 Unlike common raspberries from up North that can not tolerate tropical heat, Mysore Tropical Raspberry grows very well in hot humid climates. It grows very fast into a scrambling shrub with flexible stems and tends to bloom and fruit throughout the year. 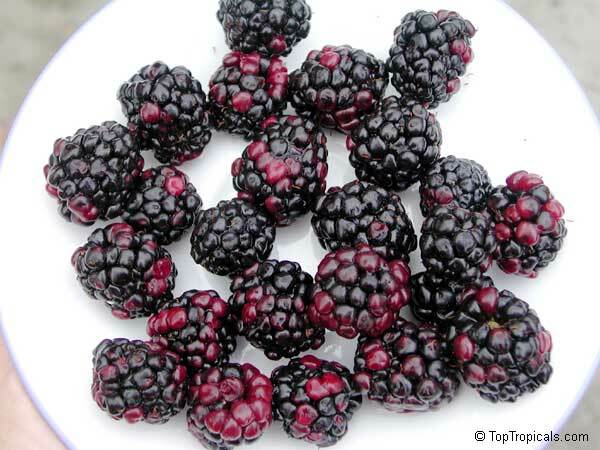 The fruit is red when unripe and purple black when ripe, very juicy and sweet. The clusters contain as many as couple dozen fruit. It is also a very ornamental plant because it has almost white canes and the leaves are green above and whitish underneath. The plant is cold hardy to upper 20s F; young plants are more cold sensitive. Great to grow in large containers and will produce large amounts of fruit. Good drainage is essential for good growth. Blackberry Arapaho is an erect, thornless blackberry bush released from the University of Arkansas. It has good fruit quality and ripens before Apache and Navaho. It is moderately vigorous. In Florida it is well adapted to extreme north Florida, very cold hardy. 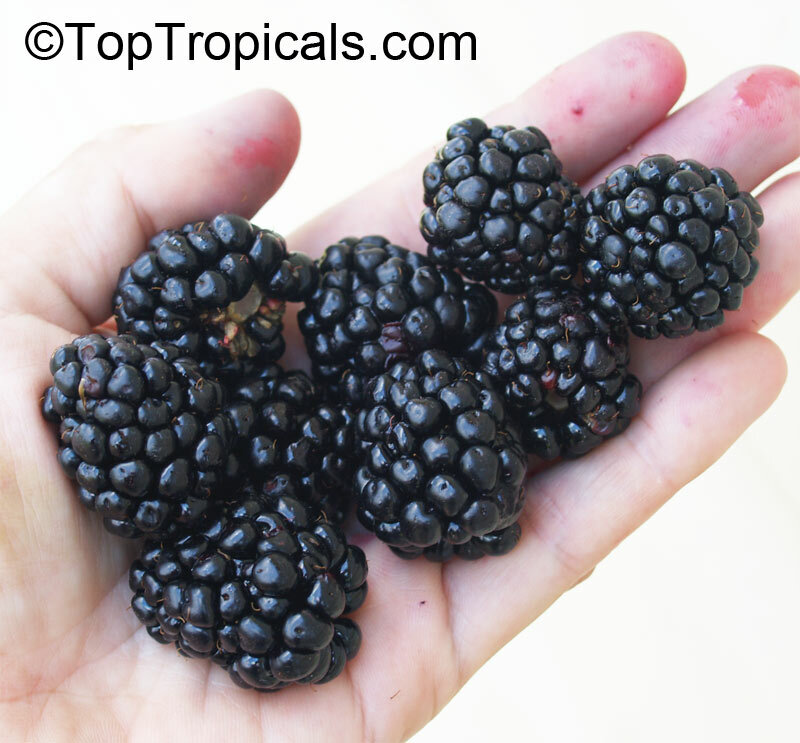 Earliest ripening thornless, beginning approximately June, and fruiting extends for about four weeks. Plants are large and developed, some are with flowers or fruit. 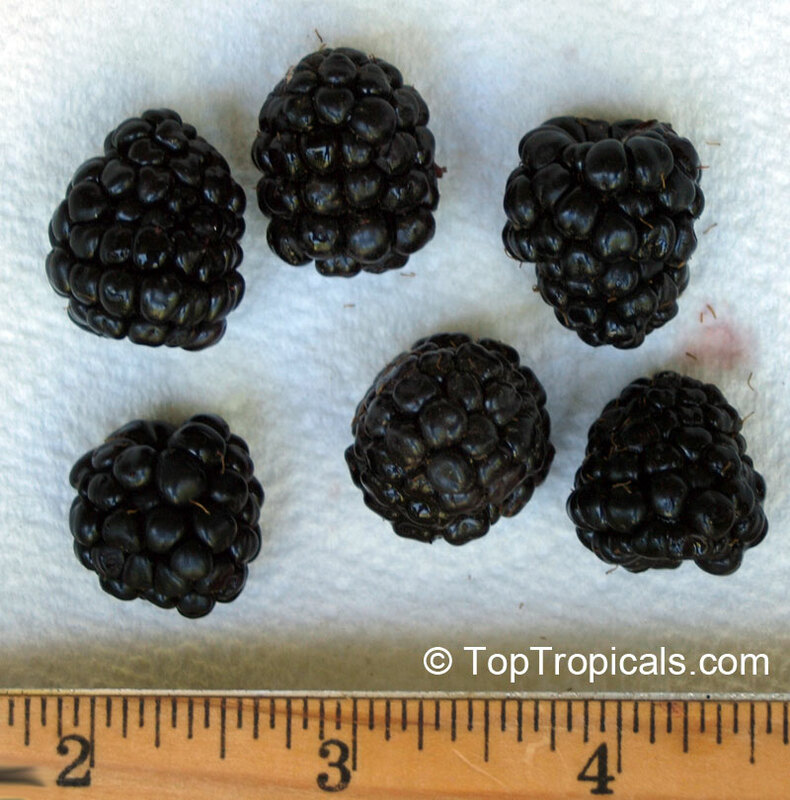 Blackberry Brazos has very large slightly elongated fruit with fairly firm flesh and excellent taste. Ripens early. Bush is vigorous and upright with erect canes. Plant is resistant to stem and leaf diseases. 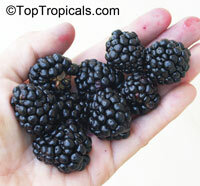 Blackberry Kiowa has very large, glossy black fruit with firm flesh and excellent taste. Ripens midseason and has long harvest season. Bush is moderately vigorous and upright. 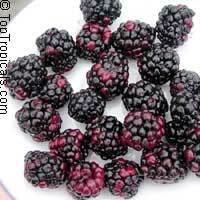 Blackberry Navaho is an erect, thornless blackberry cultivar from the University of Arkansas. Well adopted to tropical and subtropical climates. Excellent, consistently rated the highest of the Arkansas varieties. Yields moderate to high, usually higher than Arapaho. 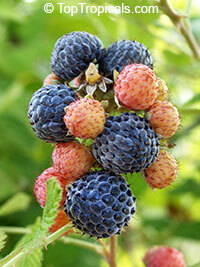 The berries are small to moderate in size, and they are moderately sweet in flavor. Late ripening and a prolonged ripening period. Ripens beginning approximately June 15; fruiting extends for about five to six weeks. Fruit very firm; storage and handling potential exceptional; can be shipped under proper conditions. Large developed plants, some with fruit and/or flowers. The world’s first thornless primocane-fruiting blackberry. 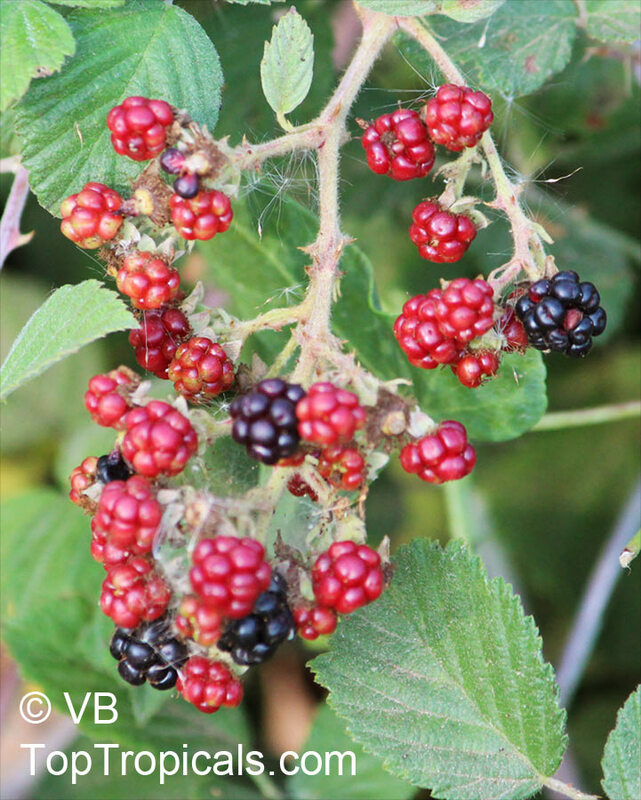 Primocane-fruiting blackberries, which flower and fruit on each season’s new branches, will potentially providing for two cropping seasons. 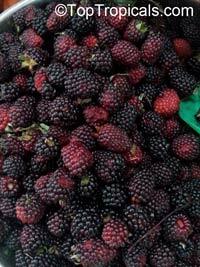 It has very large berries with good flavor. 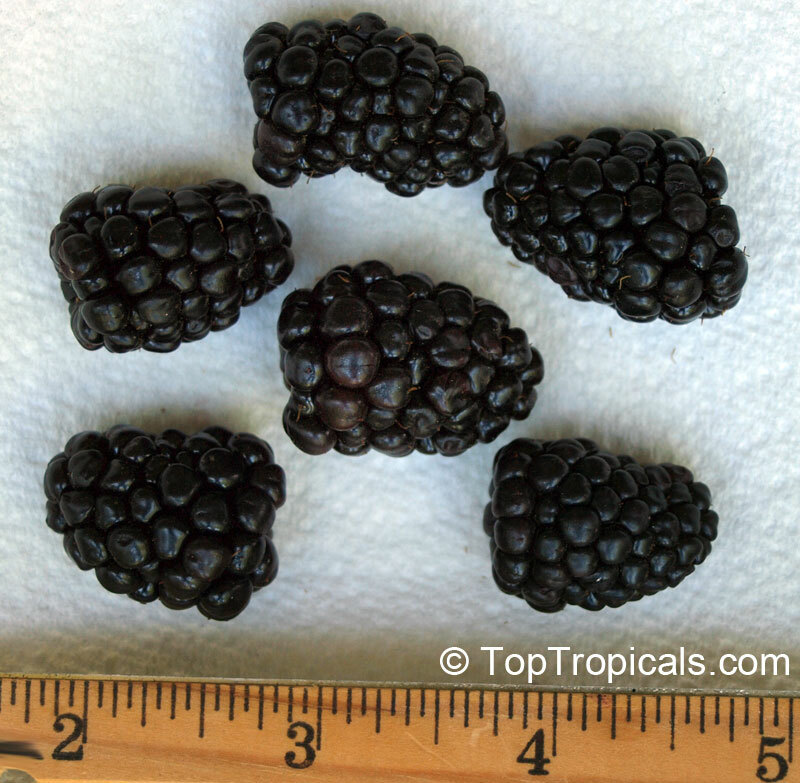 Sweetie pie is a thornless, heat tolerant, and disease resistant variety. 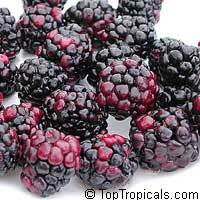 It's berries are medium size, glossy, black, and with have excellent flavor due to high soluble solids content. White Blackberry! 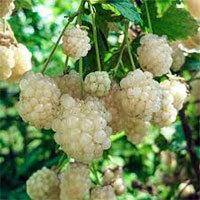 It is an unusual white variety of blackberry developed by plant breeder Luther Burbank, also known as the iceberg white blackberry or Snowbank Berry, probably originating as a pun on the name "Burbank". 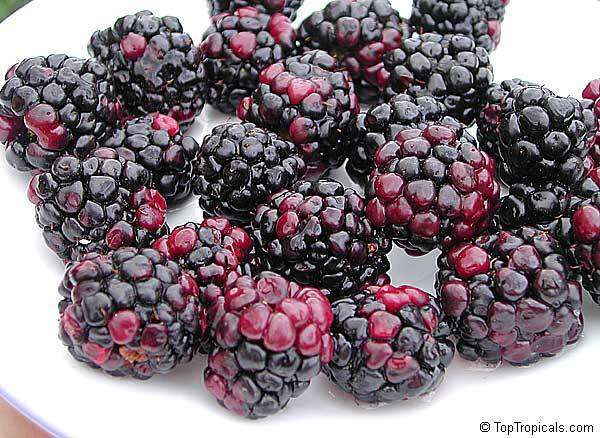 Snow-white berries are translucent, milky-white in color but have all the flavor of a “normal” blackberry. The drupelets look like tiny pearls and are simply beautiful little fruits. Berries stay whiter than other similar varieties as berries ripen, and with much better flavor. We obtained this plant in 2016, it was grown from the seeds brought to us from the plant in St. Catherines Monastery. Holy Bramble, Burning Bush of the Bible. Rubus sanctus is a symbol of God revealing himself to man. An instance of it can be found at the Chapel of the Burning Bush on Mount Sinai, where it is revered as the original burning bush of the Bible. This longevity and location lead to its Latin name. Derivation of the botanical name: Rubus - latin name for Blackberry, Raspberry; Sanctus - sacred. Rubus sanctus is a very long lived fruit shrub. The plant has no central stem; instead it produces long thin branches which can reach 5-6 feet in length. Branches have spiked thorns that bend downward. The flowers vary from pale to dark pink, followed by blackberries. The nature of the burning bush is a source of debate among botanists and Biblical scholars. Some believe that the burning bush was not a bush, but a figurative representation of a supernatural phenomenon. Others contend that God spoke through a natural bush. In the entire Old Testament nowhere does God reveal more about himself to one man than in the passage of the burning bush. In fact, this passage is sometimes called the Mosaic revelation of God about himself. The St. Catherines Monastery spiritual heart is the Chapel of the Burning Bush, an unassuming structure of tremendous religious significance. According the oldest monastic tradition, this chapel sits atop the roots of the same Biblical bush "that burned with fire, and was not consumed" (Exodus 3:2) when God spoke to Moses for the first time. Today, it is very large in size, and many monks and scholars agree that the bush's presence is the very reason St. Catherine's Monastery developed in the first place. These seeds were collected for us in Israel, in October 2016.